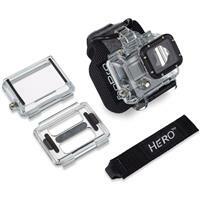 The GoPro HERO3 Wrist Housing secures your HERO3 camera like a watch flat against your wrist. Whenever you want to capture a photo or shoot some hands-free action video, you can quickly pivot the camera upright and start recording. The Wrist Housing allows you to keep both hands free and you can even strap it to a variety of sports gear and equipment like kayak paddles, kitesurfing kites, and so on. For enhanced flexibility, an adapter is included that allows the Wrist Housing to fit over bulky gear like ski gloves or a winter jacket. Plus, you can even use the Wrist Housing down to a depth of 197' since it features a GoPro HERO3 underwater housing.